The album features guest performances by Brittney Slayes (Unleash the Archers)—reprising her role as Barbarella for a re-recorded version of "Queen of the Galaxy"—and the mighty Arjen Anthony Luccassen (Ayreon, Star One, The Gentle Storm), who lends his voice and guitar skills to album-closer "Journey Beyond the Stars." Ashcraft comments, "I have been biting my tongue, mostly, for about three years now that we got Arjen to perform on one of our tracks. Those who know me understand that this is a dream come true for me. Arjen is a huge inspiration to myself and my music, and to have had the honor to work with him is something that will be a main highlight throughout my career. He is very humble and great to work with. I hope everyone is as pleased with the outcome as I am." 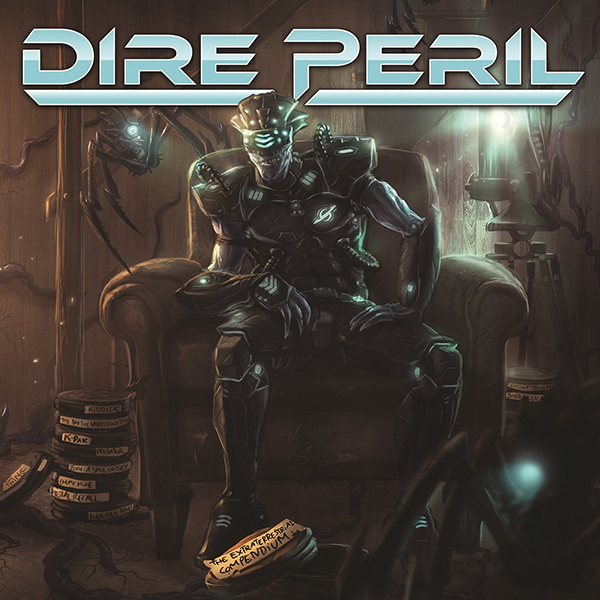 Through many obstacles, DIRE PERIL is excited to present The Extraterrestrial Compendium to the heavy metal community at large. Notes Yelland, "Working on this album was a joy. I had always admired Jason's material, so the opportunity to collaborate with him was irresistible. I am so proud of what we have accomplished, and can't wait to share this—and more—with the world..."